The other day I found a ‘vintage’ BRIO railway set, which I brought home for my little boy. He, like every other kid that’s ever owned a BRIO train set, was instantly besotted. Founded in Sweden in 1884, BRIO is probably most famous for their wooden railway sets. They now have a huge range of toys for babies and toddlers, for roleplay and of course, they keep expanding on their wooden railway sets. How I found the train set was completely by accident but almost serendipitous. My mom recently passed away and I’ve had the task of going through all her things. From her clothing to all the little bits and pieces around the house. I say ‘task’ but it’s really been a labor of love. Under my breath I’ve been grumbling and groaning about all the hoarding she did. I’ve spent days sifting through utility bills from 1995. 1995! That’s 21 years of paperwork. And clothes. My mom always complained that she never had anything to wear. So far, and I’m not yet done, I’ve donated eight bags of clothing to various charities that she would have approved of. I’ve found her boxes of jewelry, loads of reading glasses and teeth. Yes, false teeth everywhere. But my most valuable find was earlier this week. It was a box sealed with tape in the corner of the garage and on it was written ‘toys’. I carefully opened it up and inside was a treasure chest of…toys. Exactly what was written on the box. But they weren’t just any toys, they were from my childhood and suddenly I was so grateful for my mom’s hoarding. There, in amongst loads of toys, in almost perfect condition, was my BRIO doggie and my younger brother’s train set, which now belongs to my little boy. BRIO’s mission is to create happy childhood memories, from generation to generation, and in the best possible way they brought mine flooding back to me. My Dachshund now has pride of place on a shelf in my room and watching Ben play with his train set is pure joy. I’ve listed my favorite BRIO toys below, with the help of Ben, my four-year-old. Unfortunately I had to cut the list down because by the time he had finished shrieking “this one! and this one! Ooooh that one too!” I had over 250 items. How could this little guy not get a mention? After all, he was my first ‘pet’. The Dachshund has been a BRIO classic since 1953. 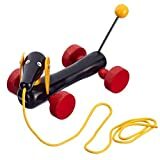 When your toddler takes the retro wooden pull-along dog for a walk, it moves its head and ears and wags its tail just like a real dog. Get your little one started off with their First Railway Beginner Pack. The brightly colored railway has a cute train, special rainbow bridge, and ramps for on and off rail play. There are loads of different track layouts and the track sections are easy to put together and take apart. The railway works with all BRIO wooden railway sets so you’ll never be stumped for gift ideas in the future. Finally a pooch your little one can ride. The iconic Dachshund from the 1950’s is ready to make new friends as a ride-on toy. Completely kid powered with feet to floor, your little one holds onto the solid wood handles and steers the movable front wheels. The playful puppy’s tail wags along happily as the ride-on moves forward. Your budding little architect will love this colorful construction set with solid wooden building blocks. The blocks are perfect for little hands to grip and there’s nothing they won’t be able to build. As with all their products BRIO pays attention to every detail in their design and remains dedicated to creating toys that encourage learning at the same time. Children have loved this BRIO classic since 1955. The colorful clown with its sturdy base is a great way for little ones to master stacking the rings on the pin; and once they’ve mastered that they can ‘build’ the clown by stacking the rings in the correct order. Get them building early. This cute Builder Starter Set is a great way for your little one to develop their hand-eye coordination and get their imaginations working. The 48-piece set includes extras parts like hammers and bolts and they’re compatible with other BRIO rail sets for endless fun. It comes in a handy plastic toolbox for easy storage. This retro crane wagon is a great addition to any growing BRIO collection. The set includes two wagons and a crane that can pick up and unload anything magnetic. The classic wooden train starter set is the perfect size for your toddler. Let them get creative with the tracks and watch the iconic little train chug through the forest, cross over the bridge, and finally, make a stop at the station. There are no batteries, motors, lights or sounds, just hours of open-ended, free-form creative play. The set has 22 pieces including 14 track sections, a special crossing bridge, an all wood brio station and three trees. Not only is this dinnerware set a great way to get little ones practising using utensils, it’s also the perfect add-on gift for the BRIO kitchen. The dinner set includes two plates, two glasses, two knives and two forks. The 50 piece country railway set is awesome! There really isn’t any other word for it. The set includes one battery operated train with reverse/forward motions and headlights, one trailer load of wood and a trailer with removable forage cargo (timber). There is also a train with two wagons, four horse figures and four trees. As a starter kit, it has everything you need to build a little homestead and there are loads of add-on pieces. The play table is the perfect space for your little one to build their BRIO world. Made from solid wood, this easy to assemble table is the perfect size measuring 4 feet by 2.5 feet and 18 inches high, and is decorated with land and sea. The raised sidewalls help keep the toys on the table, allowing for more fun and less fuss. Have any BRIO family favorites you want to share? Let us know your picks in the comments below. Feature image courtesy of Flickr, libraryrachel.